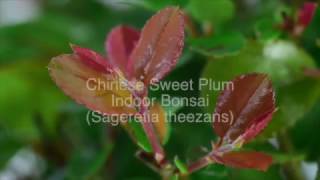 An elegant informal upright Sweet Plum (Sageretia theezans) premium range indoor bonsai tree for sale, potted into a lovely glazed reddish ceramic bonsai pot with matching drip tray. The red of the pot accentuated the colour of the new leaves. * Pot details: Red rectangular ceramic bonsai pot.